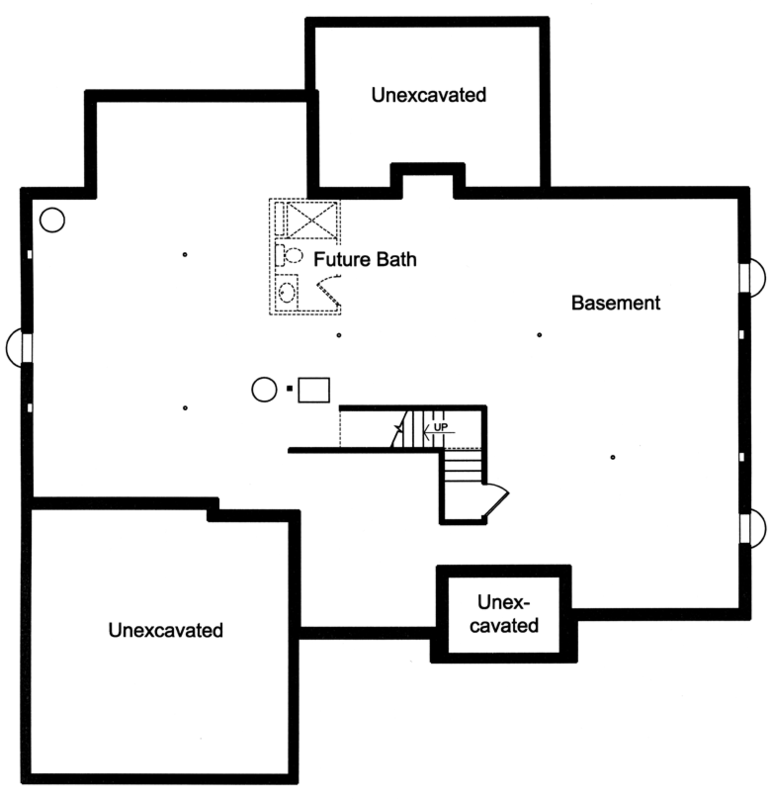 Homes for those with discriminating taste. 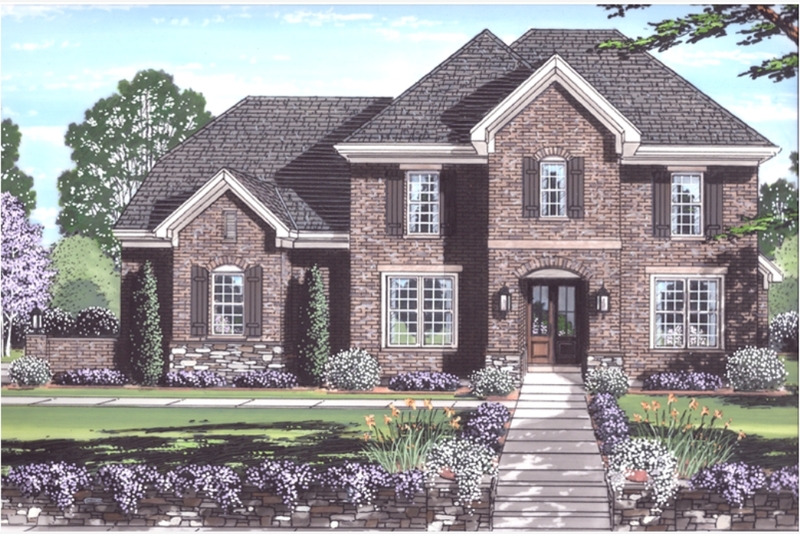 An elegantly styled home showcases a brick exterior with limestone trim, arched windows, and a varied roof line. 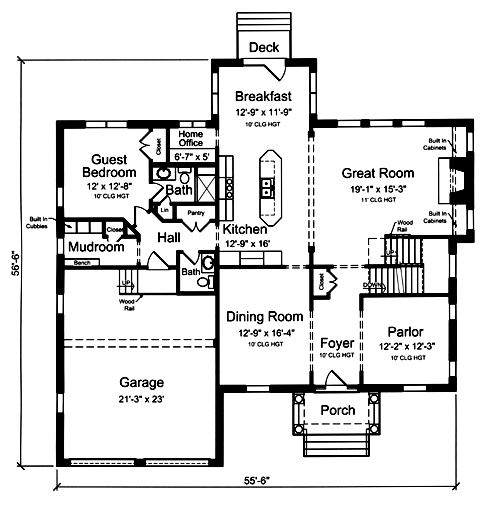 The interior boasts formal living areas including a Great Room with fireplace and a Dining Room. The Library offers a private area for work at home and is decorated with French Doors that lead to an outdoor Terrace. A wonderfully equipped Kitchen includes a pantry cabinet, wall oven, 36" cooktop space and 48" refrigerator space. An island with seating anchors the Kitchen and enjoys a view through the Breakfast area to the spectacular covered rear Porch. A wood burning fireplace warms this outdoor gathering place. 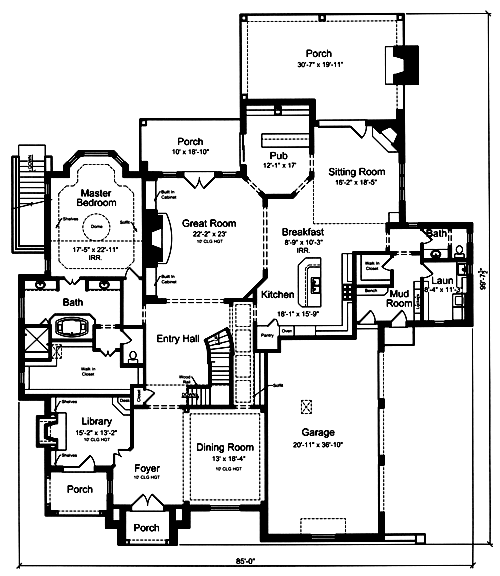 A Hearth Room and Play Room offer intimate family gathering spaces while a Mud Room, Laundry Room and Butler's Pantry provide order to the home. 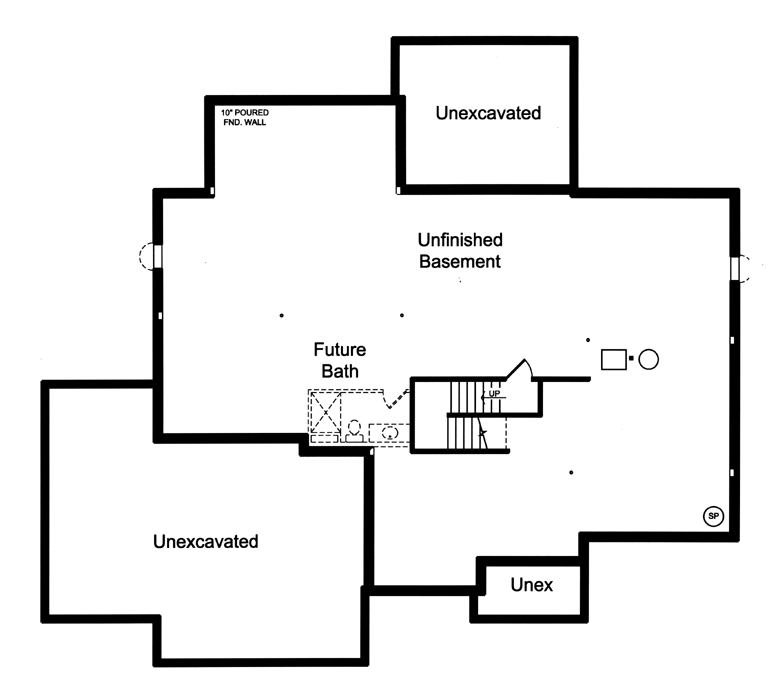 A second floor Master Suite with gas fireplace pampers the homeowner with its luxury. Three staircases, one of which is a spiral stairs, eases the flow throughout the home and the finished lower level emcourages fun times. A covered porch wraps around from the front to the side and combines with stone, brick and shutters to decorate the façade offering texture and color. 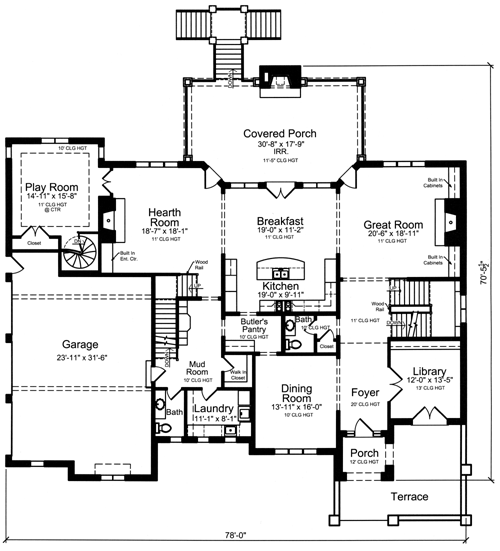 Formal and informal Dining, a private Study, Great Room, with corner gas fireplace and high ceiling and a large kitchen with walk-in pantry and island with seating create a functional first floor plan. The Mudroom, tidy Home Office and Laundry Room help maintain order. 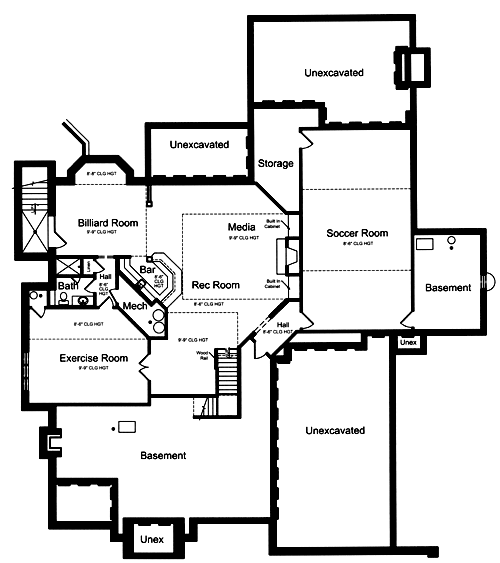 The second floor Master Suite showcases two walk-in closets, two vanities and a whirlpool tub and shower. 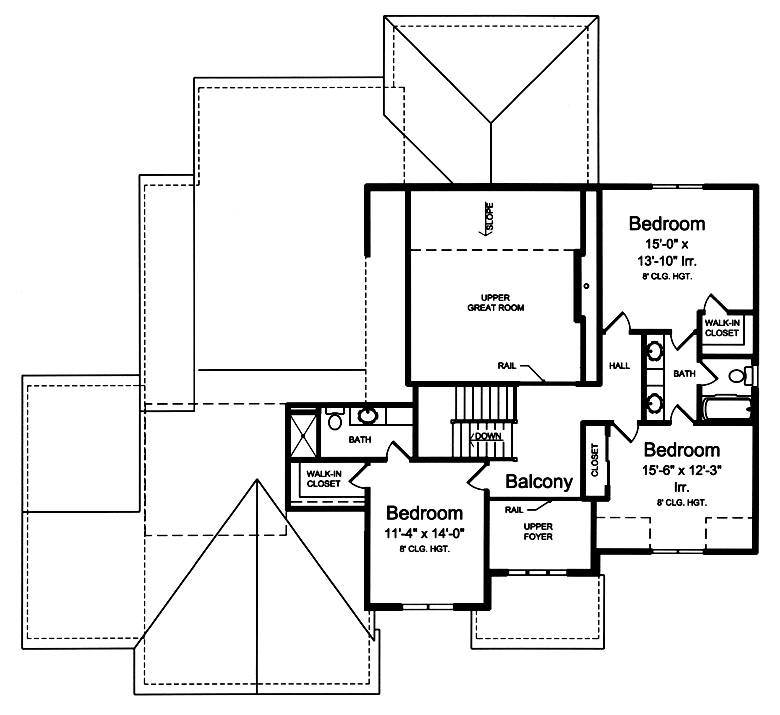 Secondary bedrooms enjoy large closets and provide loads of space for your growing family. 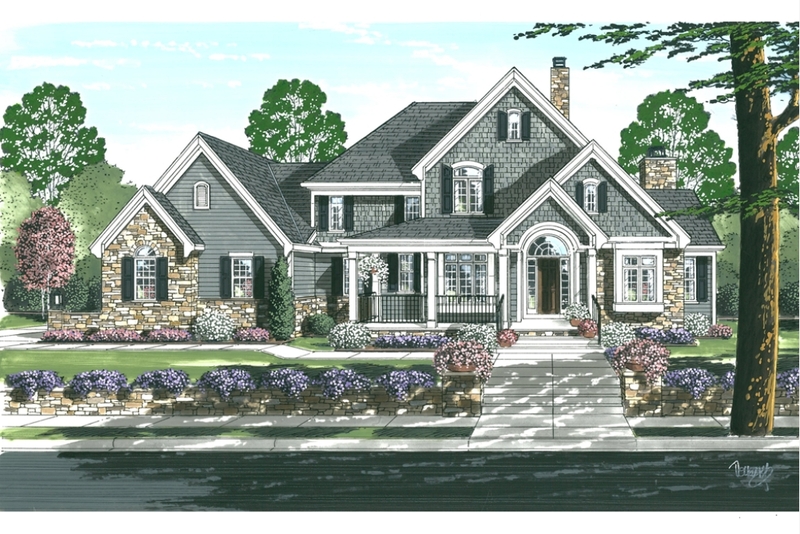 A beautiful country exterior with arched windows and doors introduces a grand interior floor plan. The many exciting rooms that the homeowner will enjoy include: a formal great room and dining room, hearth room, hunt room, conservatory and Pub. 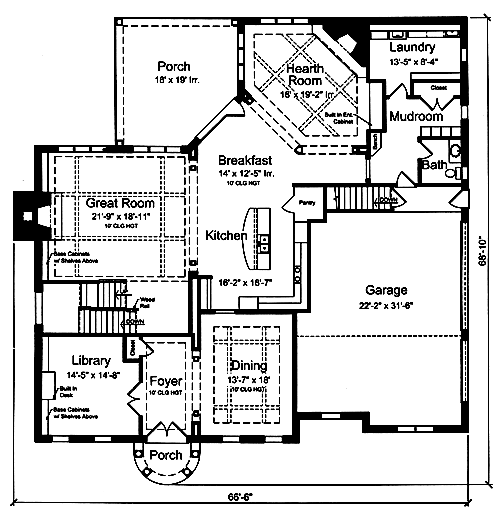 The kitchen showcases a large island with seating, and walk-in-pantry. 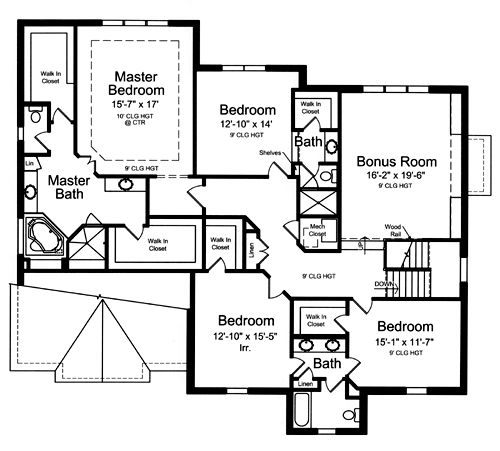 The regal master suite features: a raised ceiling, sitting area, summer shower, master bath with whirlpool tub, shower and a large walk-in closet. 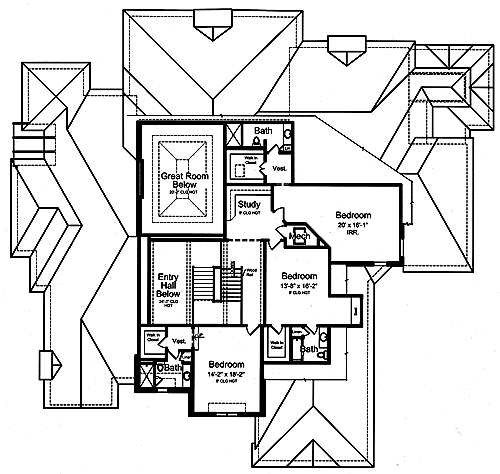 Three bedrooms each with a large walk-in closet and private bath plus an open shared study tops the second floor. 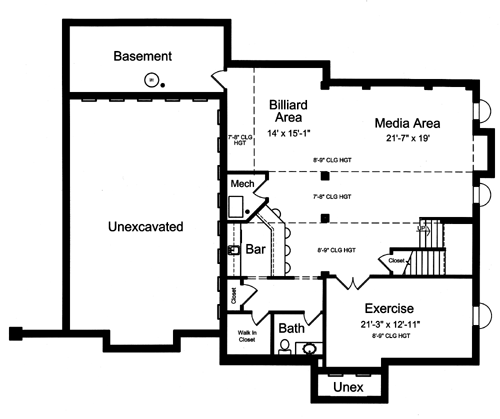 An optional finished basement offers a billiards area, media space and exercise room. A large rear porch with fireplace boasts a wonderful outdoor gathering space. 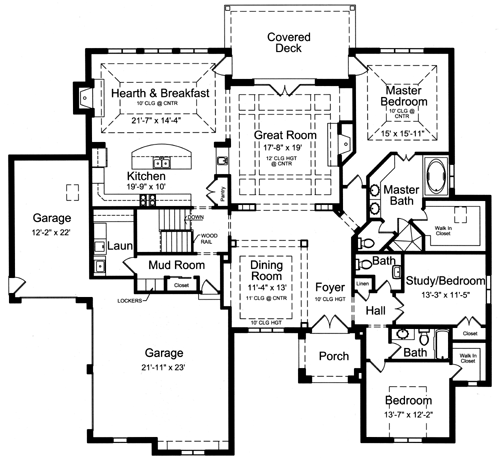 Sophisticated and functional are words used to describ this wonderfully designed one level home. 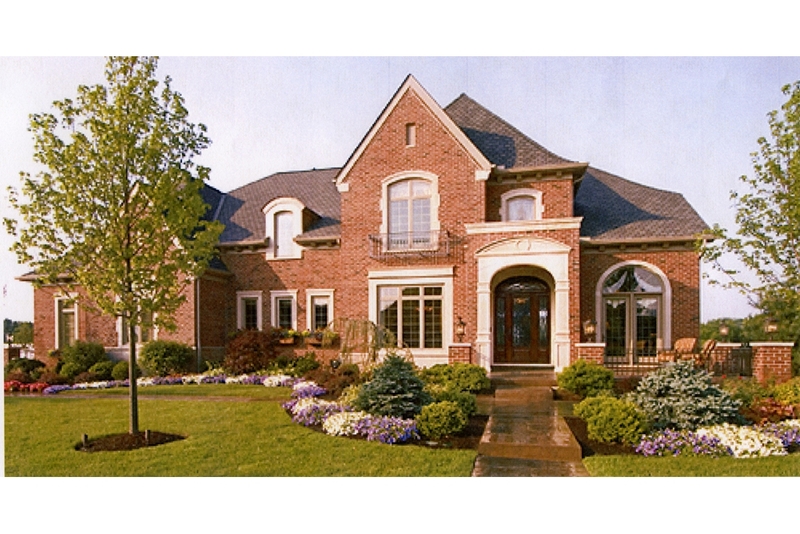 Brick, stone, multiple gables and carefully selected details create a beautiful facade. 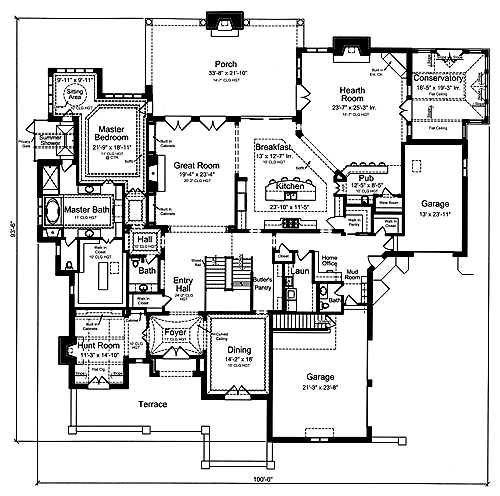 The open floor plan showcases a Great Room (with gas fireplace), Kitchen (with large island) and spacious, informal dining area each space topped by an 11' raised ceiling height of various styles. A delightful, covered rear porch expands the living spave for outdoor enjoyment. 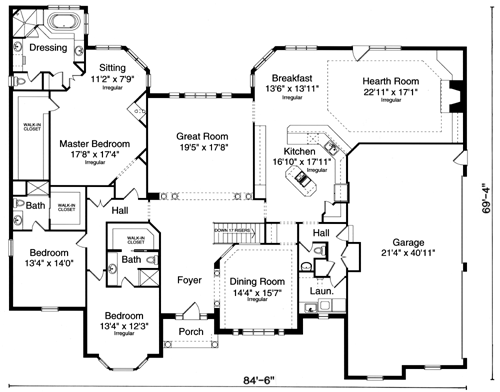 For convenience and order a large Laundry Room, Mud Room, closet and Powder Room are smartly located at the family foyer. 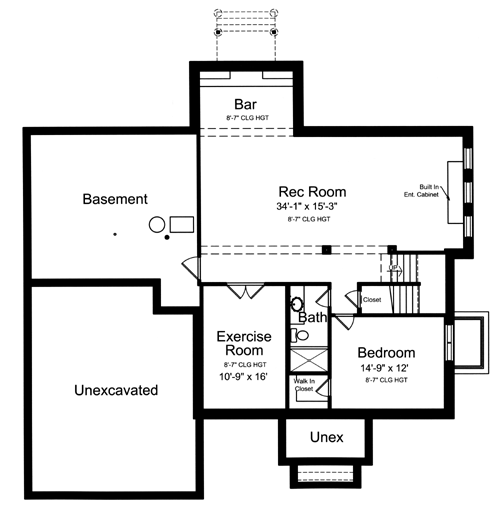 A raised ceiling, whirlpool tub, shower and double bowl vanity provide luxury to the Master Suite. 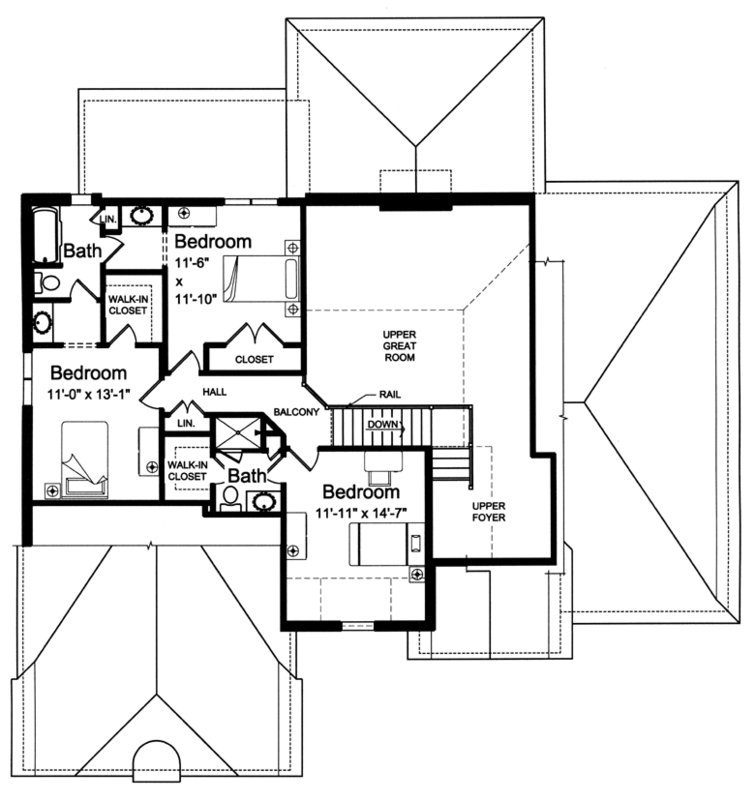 Two additional bedrooms each with walk-in closets and a Study complete this ideally designed home. 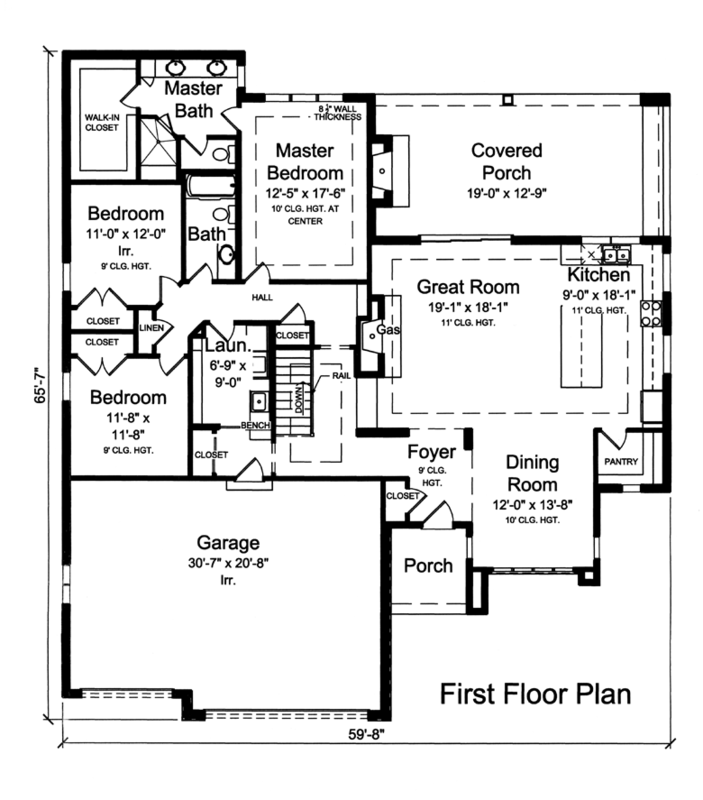 Included with this home is a finished basement plan and unfinished basement to meet you personal needs. 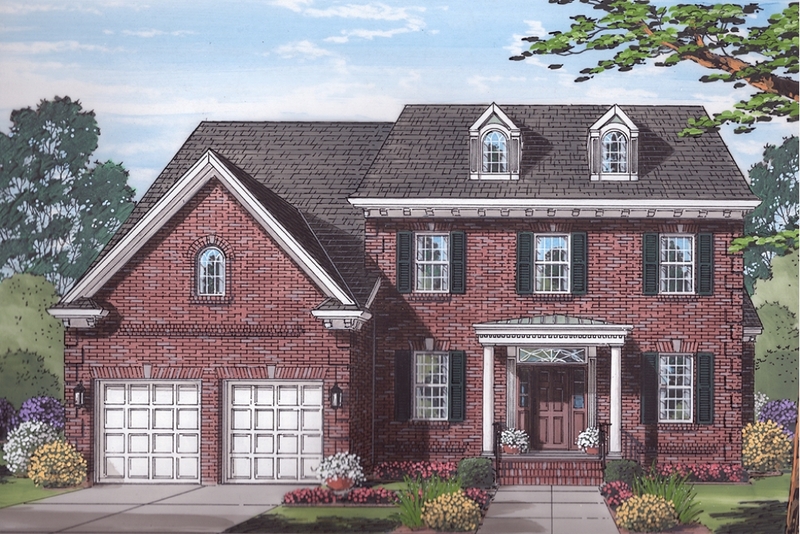 This 4 bedroom two-story home with second floor Master Suite is designed to showcase a brick and stone exterior with sloped roof line and multiple gables. 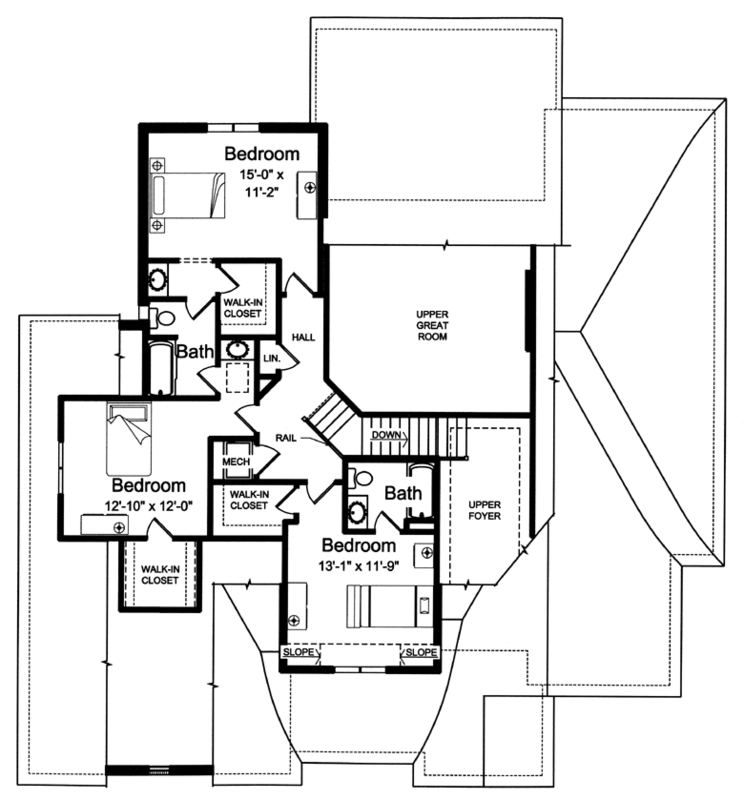 The main level offers a contemporary layout with open floor plan, gas fireplace and sloped ceiling in the Great Room and beamed ceiling in the Dining Area. The Kitchen with 7' island and the informal dining area serve the family well for entertaining and small family gatherings. 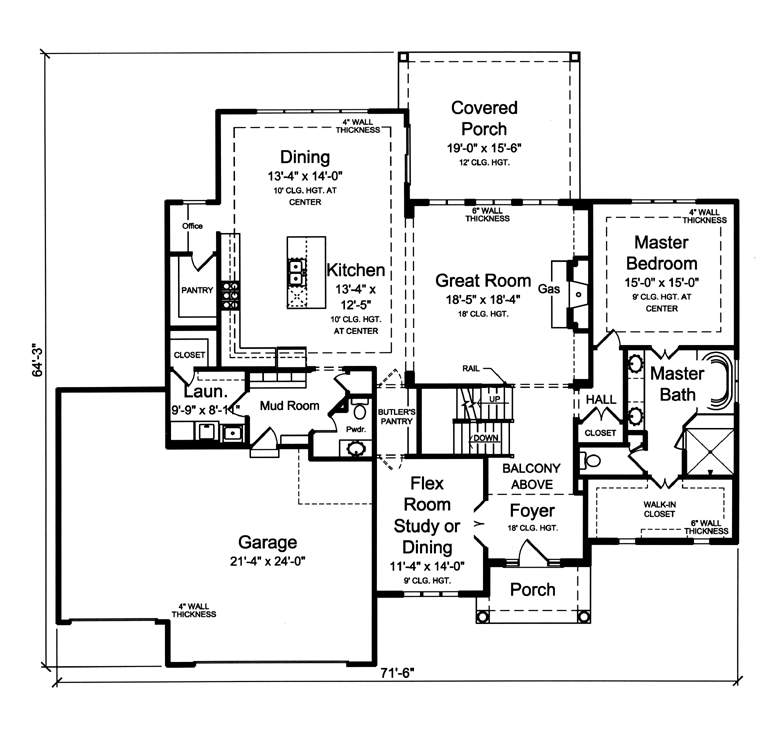 A Flex Room can be used to what best fits your family's needs (as a private Study or use the alternate plan and you can have a formal Dining Room). 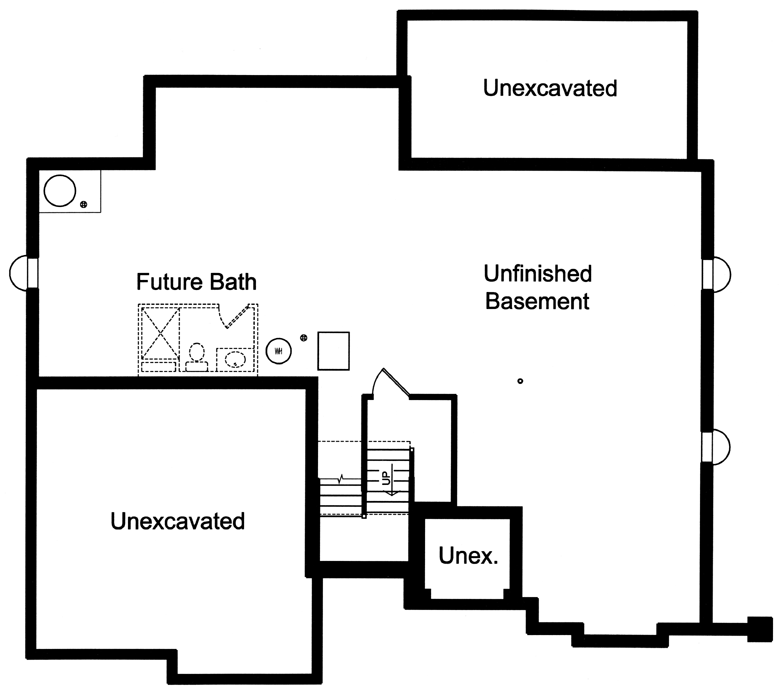 The Master Bedroom enjoys a whirlpool tub, double bowl vanity and large shower. 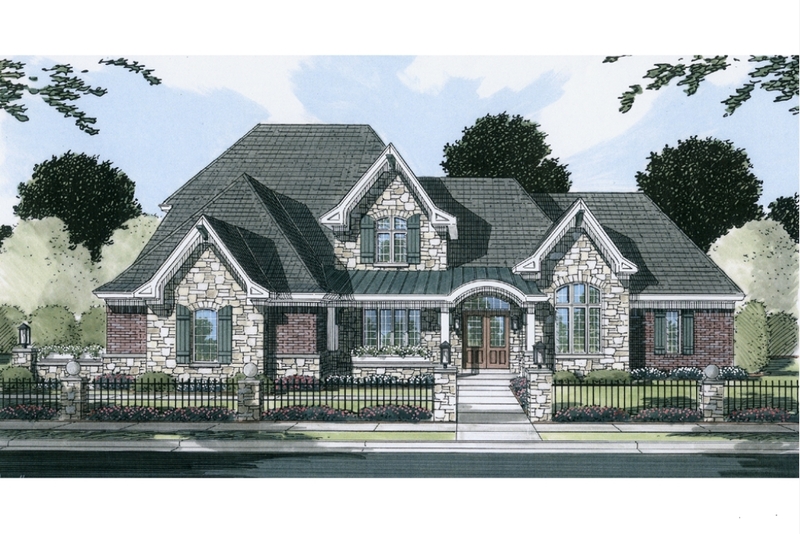 Three additional bedrooms each with a walk-in closet complete this European inspired home. 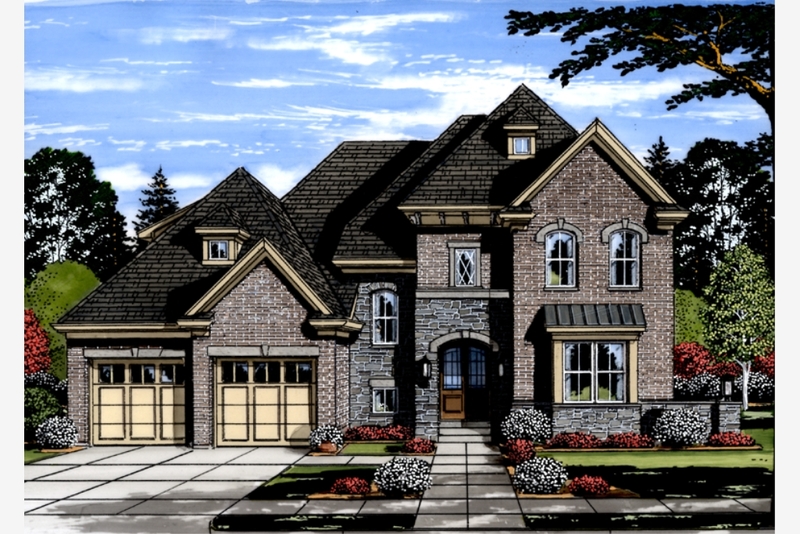 A beautiful exterior with brick, stone and siding introduces a wonderful interior floor plan featuring a first floor Master Bedroom Suite, Library, Dining Room and an open Kitchen showcasing a 9' island with seating. Informal dining overlooks the rear yard and offers access to the covered porch. A family entry at the garage creates a mud room and drop zone for miscellaneous items helping to maintain order to the home. 9' first floor ceiling heights are standard throughout. 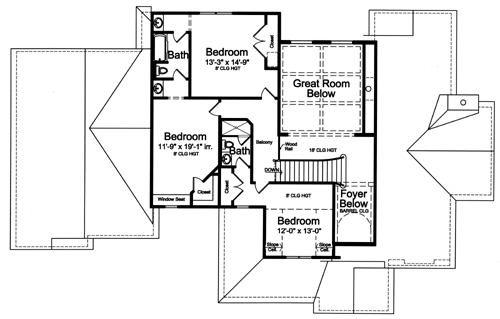 Three bedrooms are located on the second floor with each offering a walk-in closet and private bath entry. 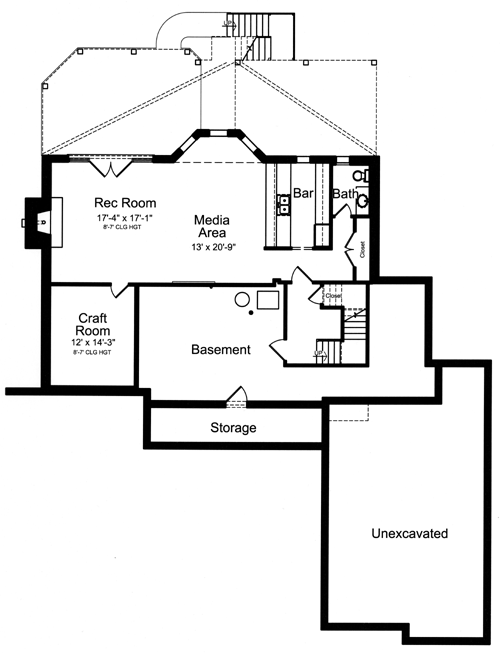 A full basement can provide additional living space for the man cave or storage. 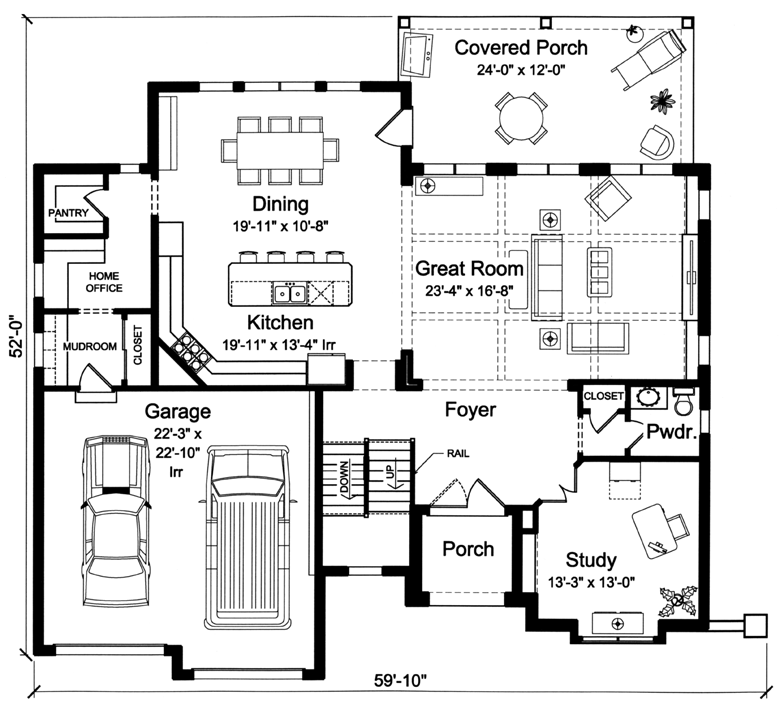 A spacious first floor layout, an open floor plan and functional spaces combine to make this a beautiful, family friendly home. The large Great Room showcases a 10' ceiling height and a beamed ceiling. Family gatherings and holiday entertaining will be fun and impressive in this large informal dining area and spacious kitchen. A 9' island defines the spaces and provides additional seating. Multiple windows across the rear bring in an abundance of natural light and a Covered Rear Porch expands the living space to the outdoors. A large walk-in Pantry, drop zone for mail and school papers and a mud room at the garage entry help maintain order to the first floor. A private Study/Office area affords privacy for some alone time. 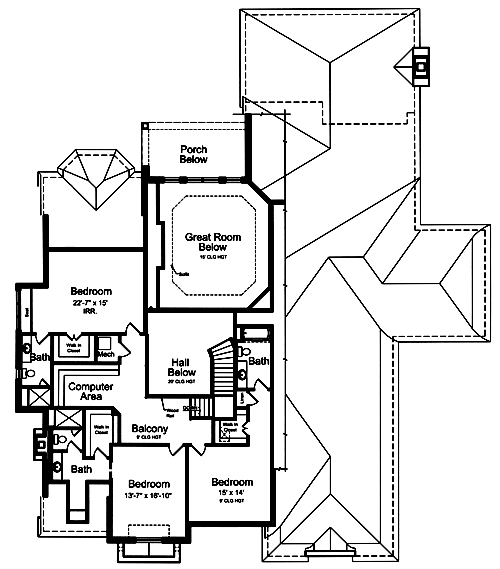 Turnaround stairs lead to a 4 bedroom second floor Master Bedroom Suite that pampers the homeowner with style and luxury. 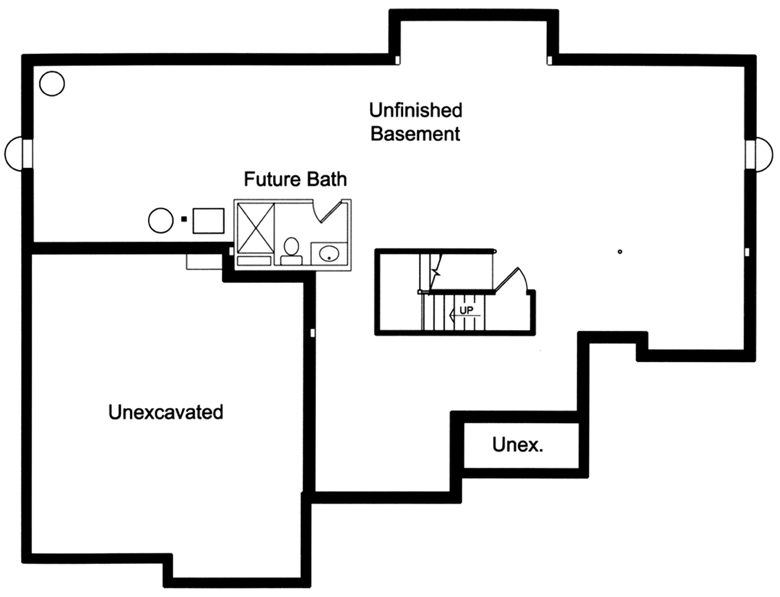 Completing the upper level are three additional bedrooms each with a large closet and one boasting a private bath and a conveniently located laundry room. 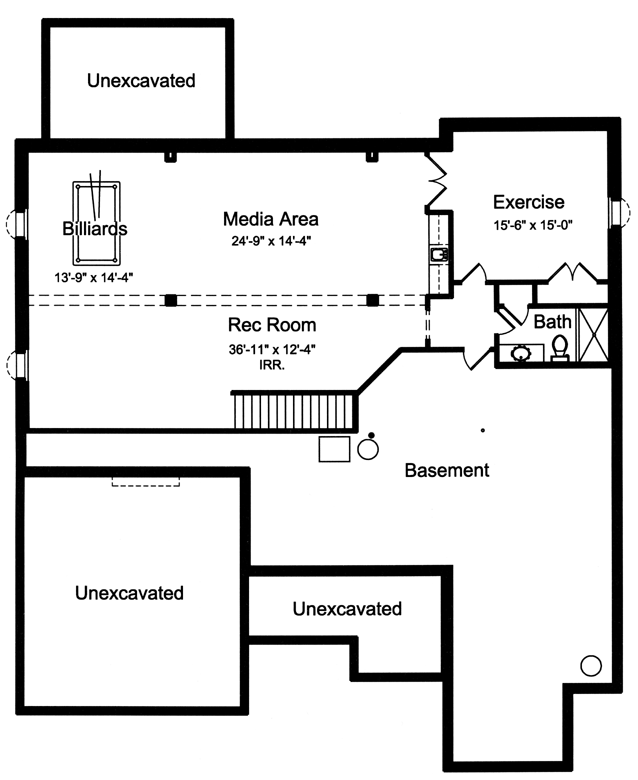 This plan comes with a full basement for future additional square footage. 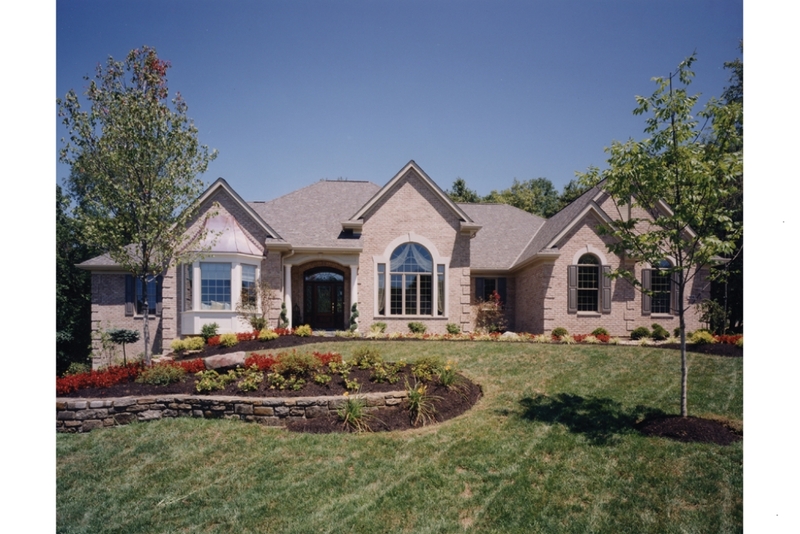 A colonial design accented with brick, stone and siding offers texture and color to the exterior of this lovely home. A cozy front porch, large screened porch and open deck creates wonderful outdoor living spaces. 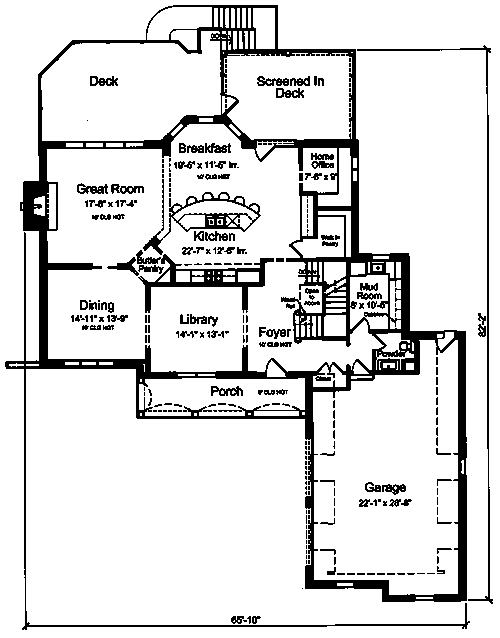 Great interior spaces range from a Library, formal Dining Room, Great Room with gas fireplace, Kitchen with large island, Breakfast Area with bay window, office alcove, large pantry and mud room. 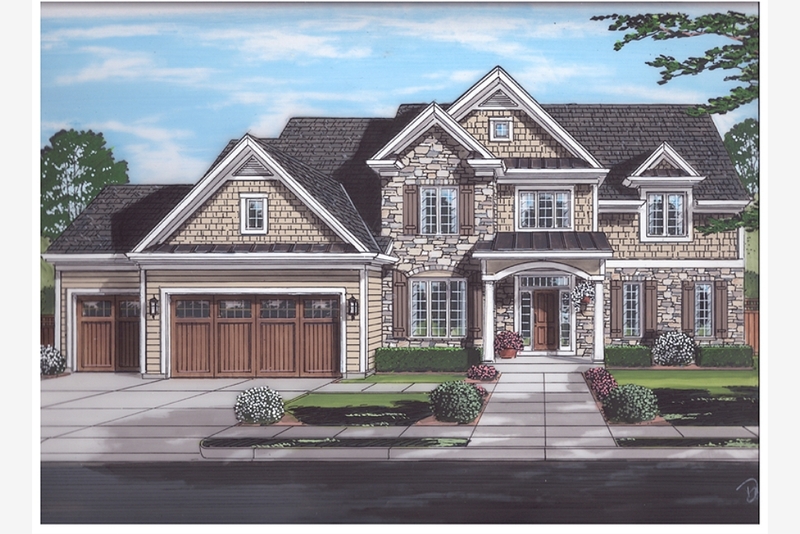 At the Foyer a beautiful staircase leads to the second floor where a Master Bedroom Suite pampers the homeowner with its personal gas fireplace, two walk-in closets, double bowl vanity, shower and whirlpool tub. Imagine the pleasure you'll feel offering your overnight guests a spacious guest suite with private bath. Two secondary bedrooms each with a walk-in closet and a laundry room complete this wonderfully appointed family-friendly home. This home has everything your family could need. A stately exterior making a great first impression, formal and informal Dining, an island that offers counter seating, a parlor at the entry that creates a formal room for accepting guests, a small alcove near the Kitchen offering a place to hide your computer and papers, a mudroom at the garage entry providing order to the home and a guest suite with private bath. From the kitchen you can enjoy a stunning view to the Great Room where a gas fireplace with built-ins, a rear wall of windows and 11' ceiling height decorate this delightful gathering space. 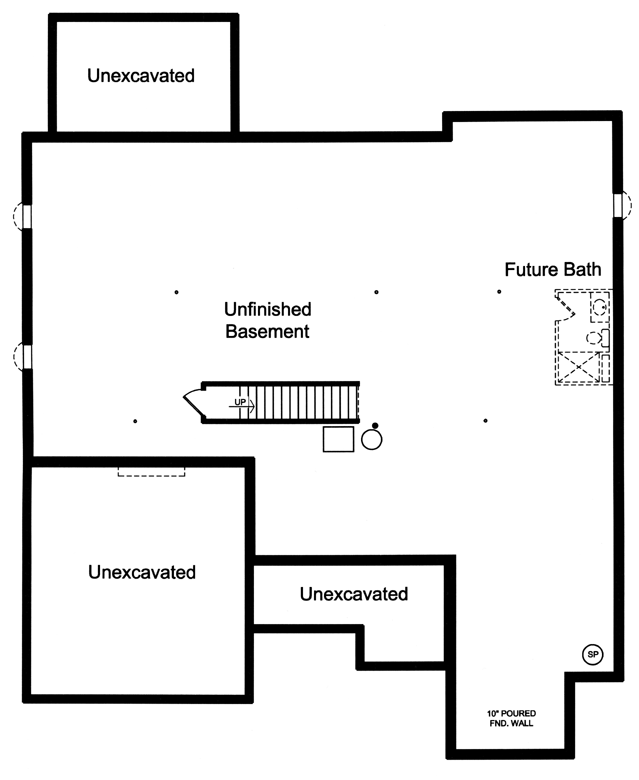 The second floor Master Suite showcases a whirlpool tub, double bowl vanity and shower. 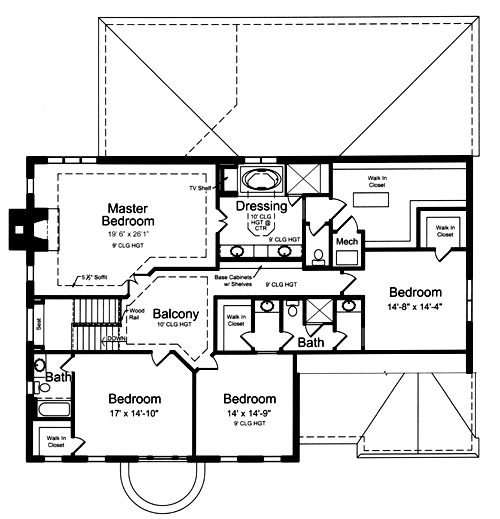 The Master Closet can be accessed from the bath or laundry room for additional bedroom or playroom completes the second floor and a cedar closet offers seasonal storage. 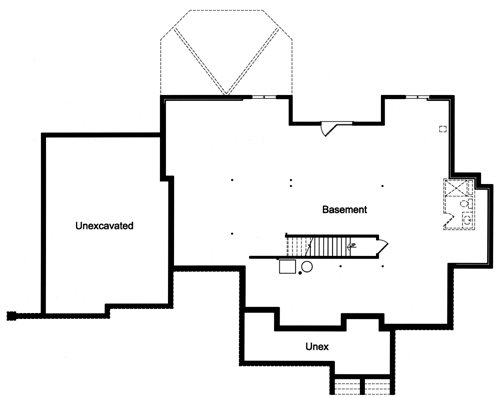 Additional fun space is offered in the finished basement level. Standard ceiling heights inlcude 10' on the first floor and 9' on the second and 8'7" in the basement. 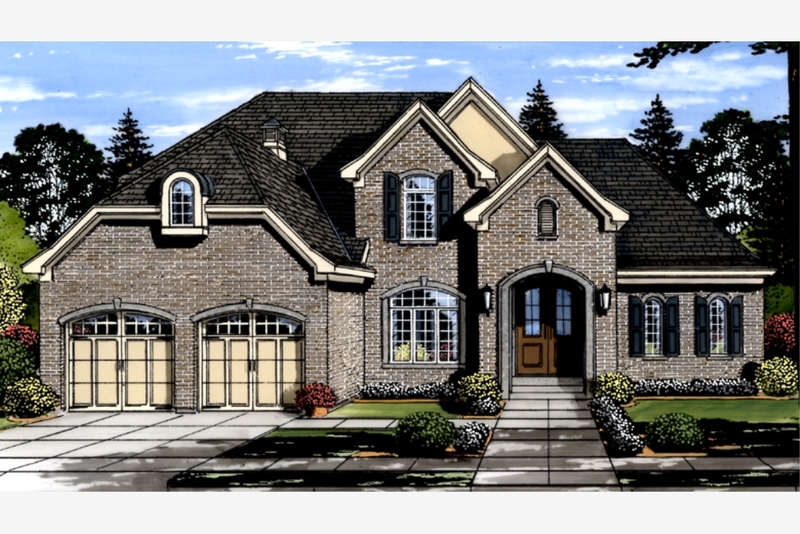 A brick façade with heavy limestone trim and arched gables creates a beautifully appointed exterior. 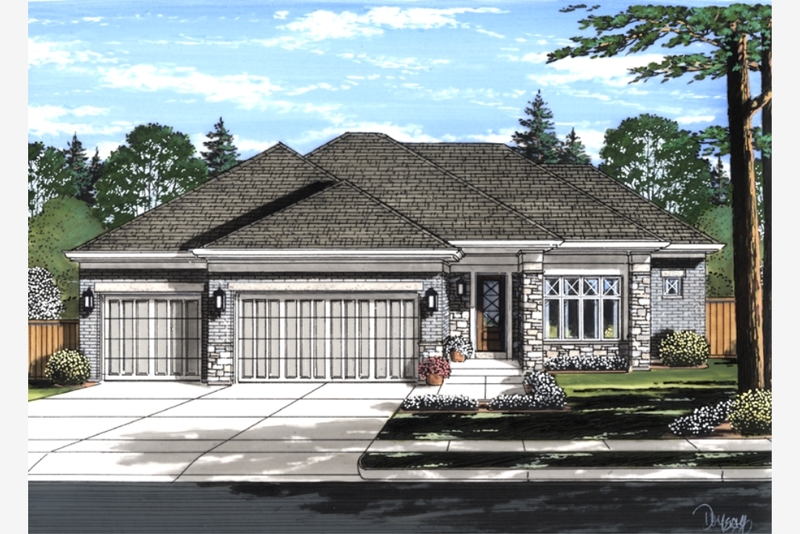 Covered porches provide wonderful outdoor living spaces and the luxurious interior includes a Library, Great Room and Sitting Room each with a gas fireplace, high ceilings throughout with a 2-story entry hall, a Pub with wet bar, and Master Suite with a lavishly equipped bath. A large pantry, wall oven, island with seating and 6 burner cooktop enhance the cooking experience in this designer Kitchen. 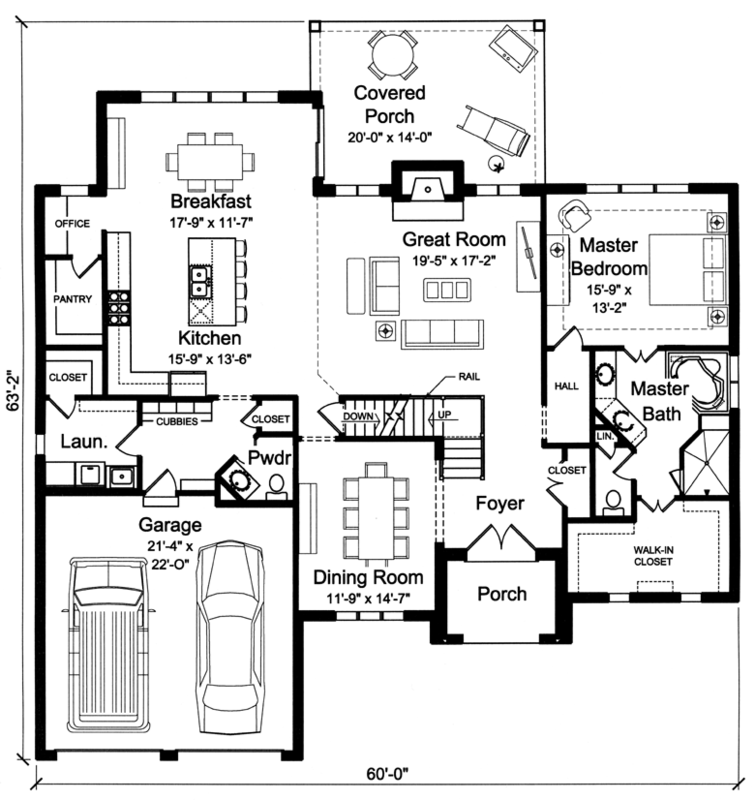 Each family member will feel pampered in their own bedroom with private bath and walk-in closets. From the balcony you can enjoy a dramatic view to the Entry Hall below and a centralized computer area makes sense for the younger family members. 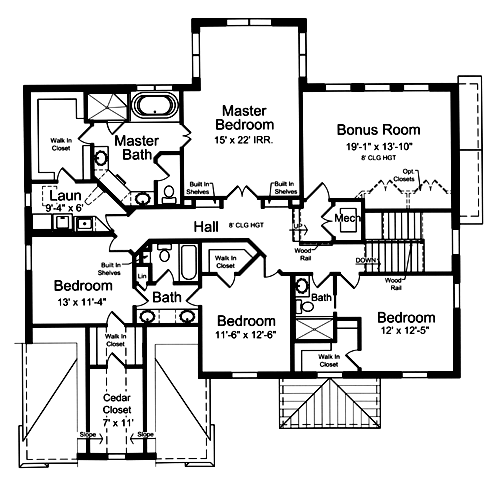 Hours of fun and relaxation is the intent of the finished lower level. 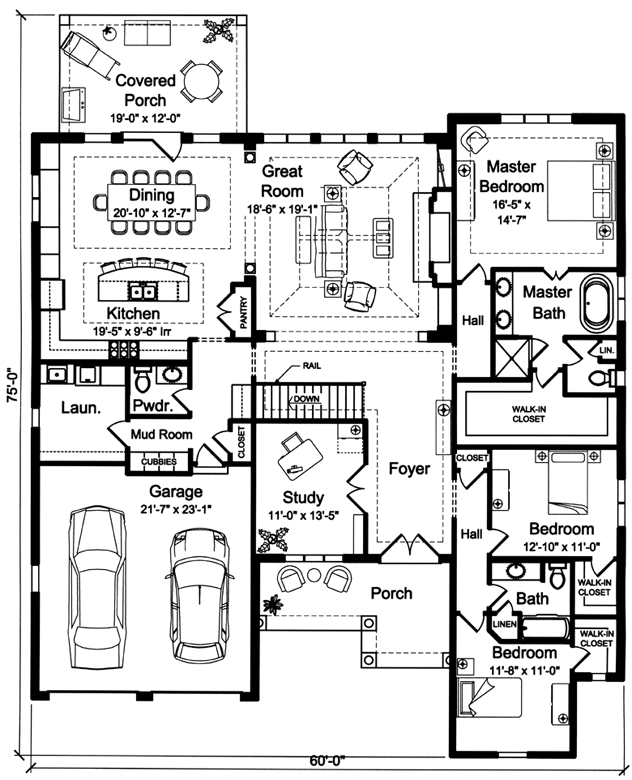 A three car garage and serviceable mud room with large walk-in closet helps maintain order. 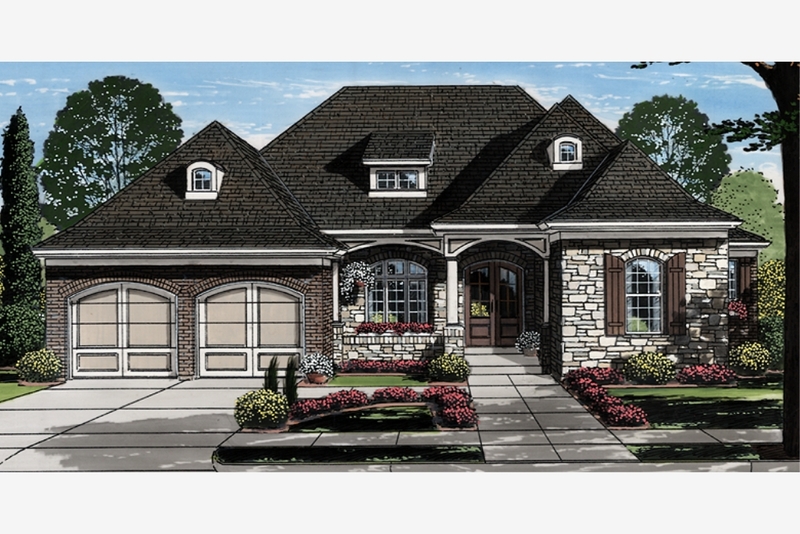 This basic 2-story home, with all its cost-saving features showcases a multitude of luxurious amenities in a traditional package. A rounded balcony. 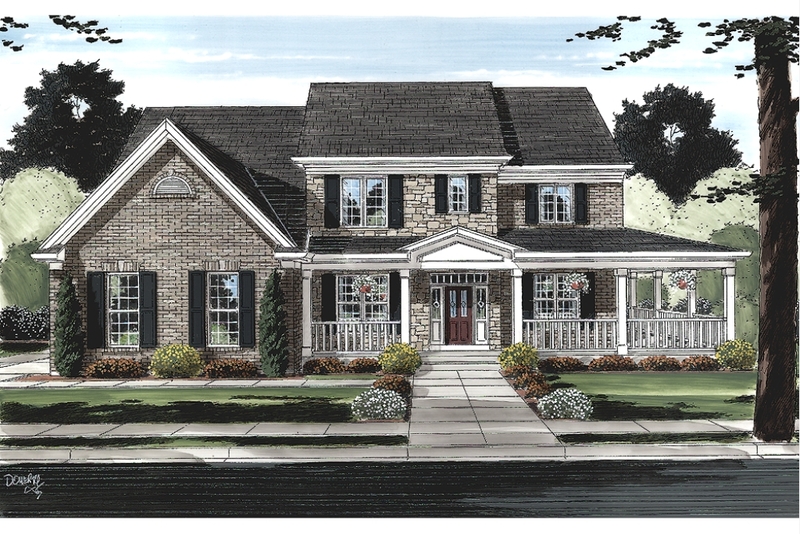 Columns, double doors and arched top window highlights the front entry. Ten foot ceilings are standard throughout the main level; while the Great Room features a beamed ceiling, built-in bookshelves, gas fireplace and view to the rear yard. The Kitchen, with walk-in pantry and island with seating, enjoy a view to the Great Room and easy access to the informal and formal Dining spaces. The cozy Hearth Room repeats the beamed ceiling, built-ins and gas fireplace elements and a covered rear porch provides a wonderful outdoor living space. 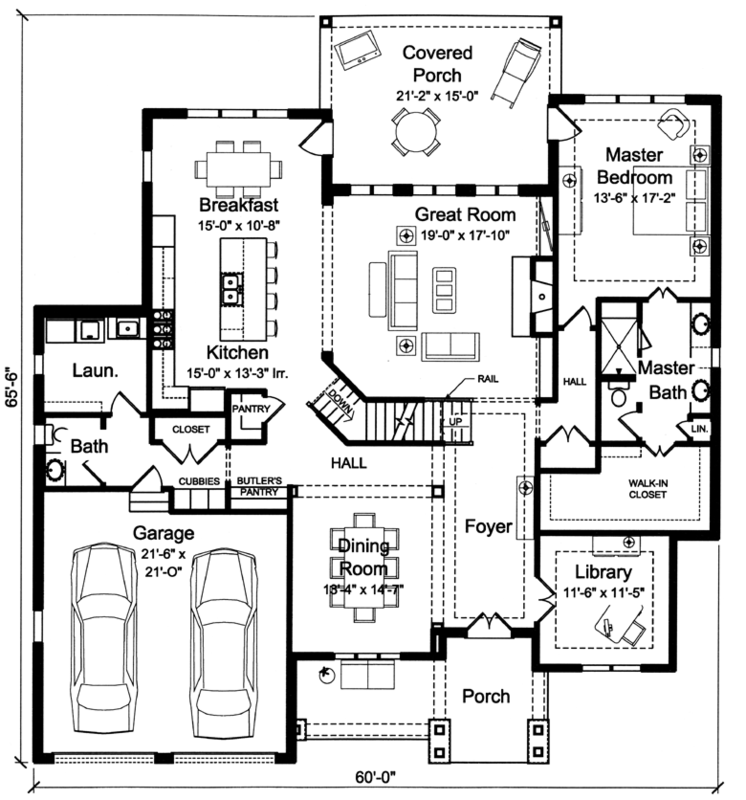 To help maintain order, a large mudroom with closet and cubbies and a spacious laundry room are set behind the three-car garage creating an organized family entry area. 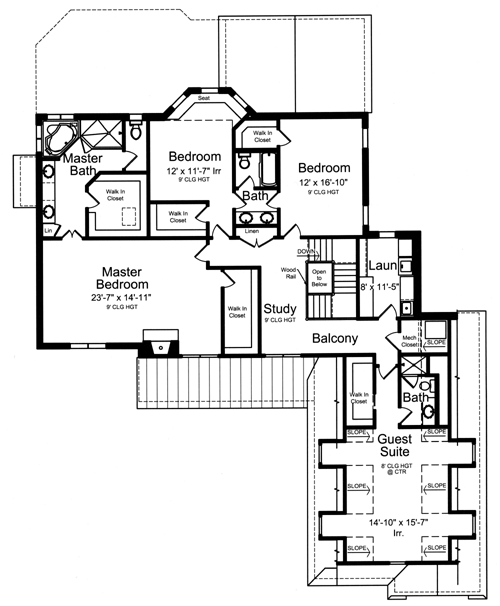 The second floor Master Suite enjoys a raised ceiling, fireplace and luxuriously appointed bath/dressing room. 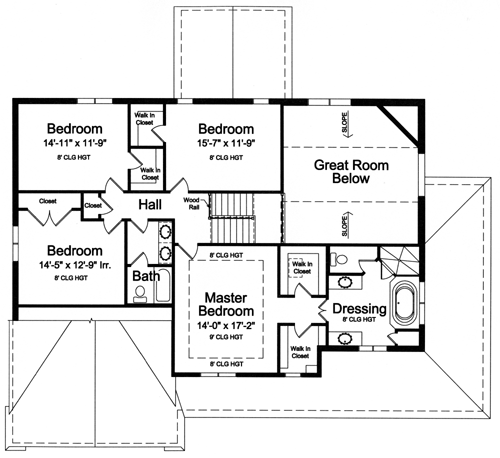 Three additional bedrooms each with a walk-in closet and private bath access will excite all family members. 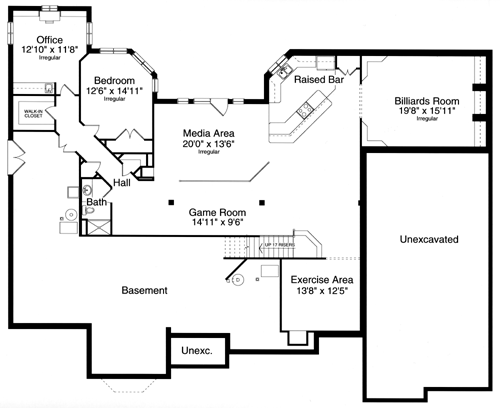 A finished lower level is designed for fun and entertainment. 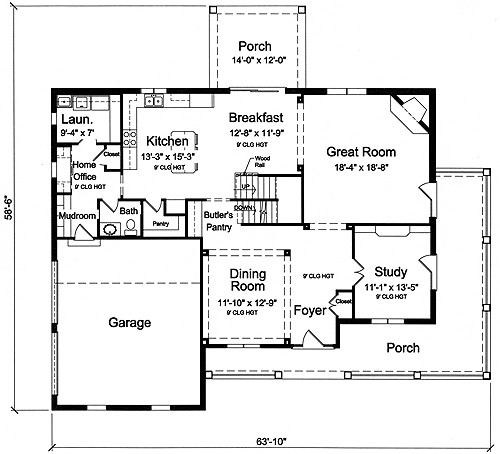 Every square foot of this home is used efficiently, creating a true per-square-foot value. 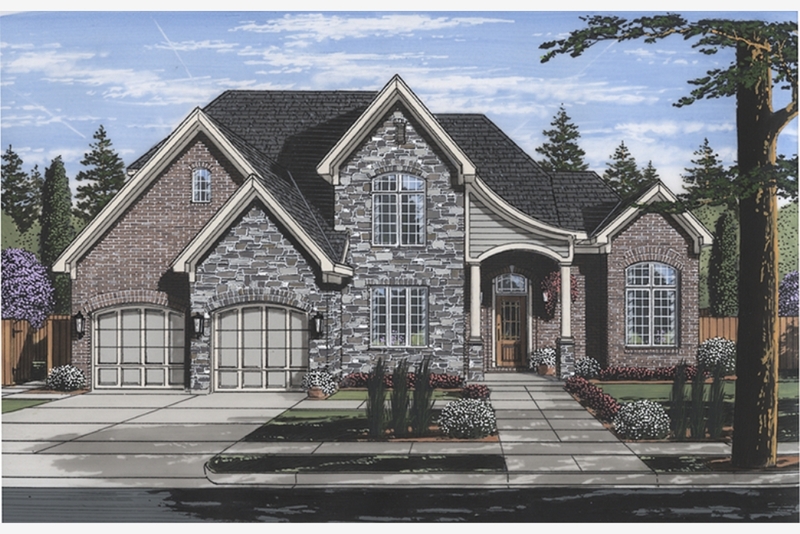 A four bedroom two-story home with second floor Master Bedroom Suite, walk-in closets and private bath entry in each bedroom and a bonus room makes this home plan a perfect design for a growing family. 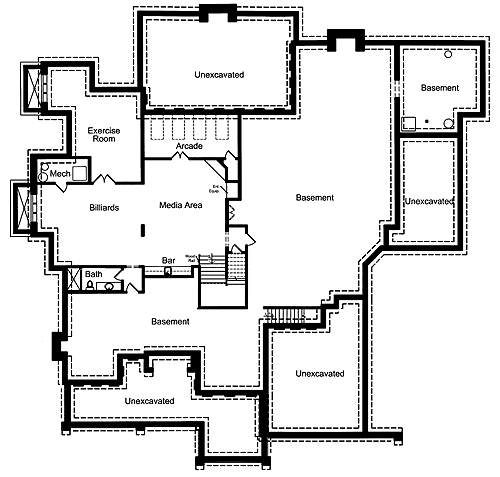 The first floor showcases 10' ceiling heights and large rooms. A gas fireplace and beamed ceiling decorate the Great Room while the kitchen features a 6 burner range, wall oven and pantry. Bar seating, a Breakfast Area and Formal Dining Room provide for all dining occasions. 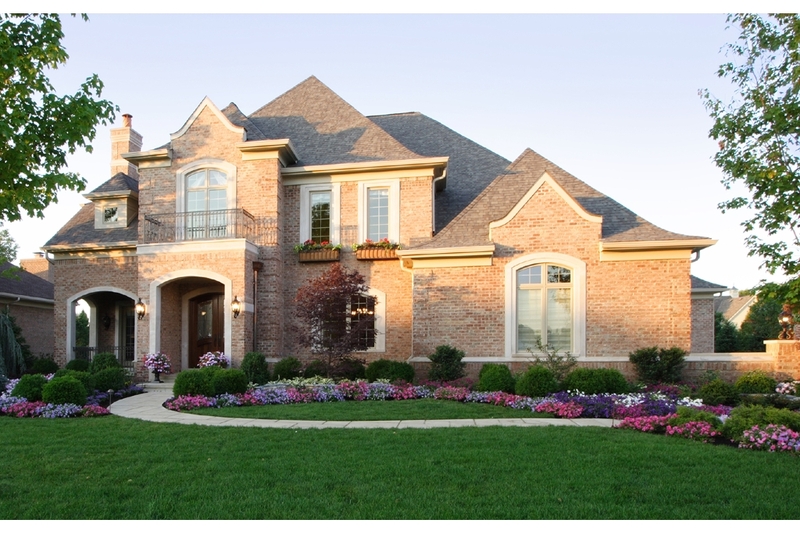 The solid brick exterior with shutters and stone trim offer a low maintenance exterior. 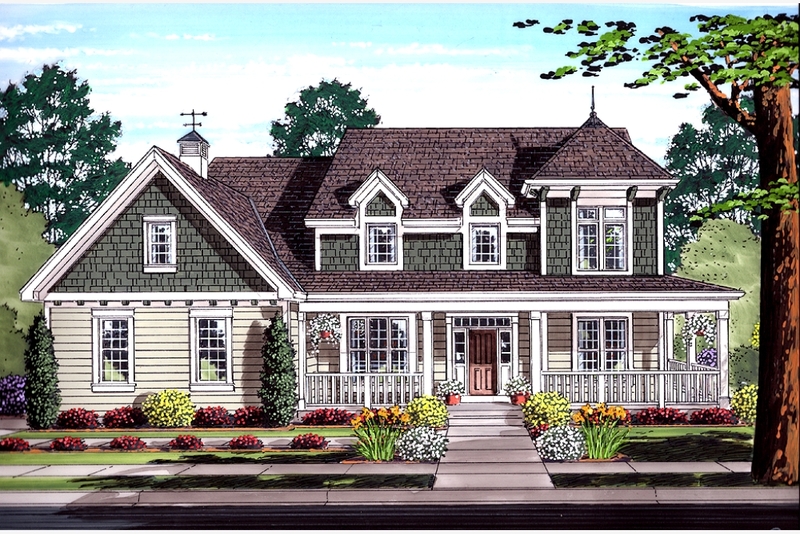 A covered front porch and rear deck create wonderful outdoor living spaces in this beautiful 4 bedroom, 2-story home. 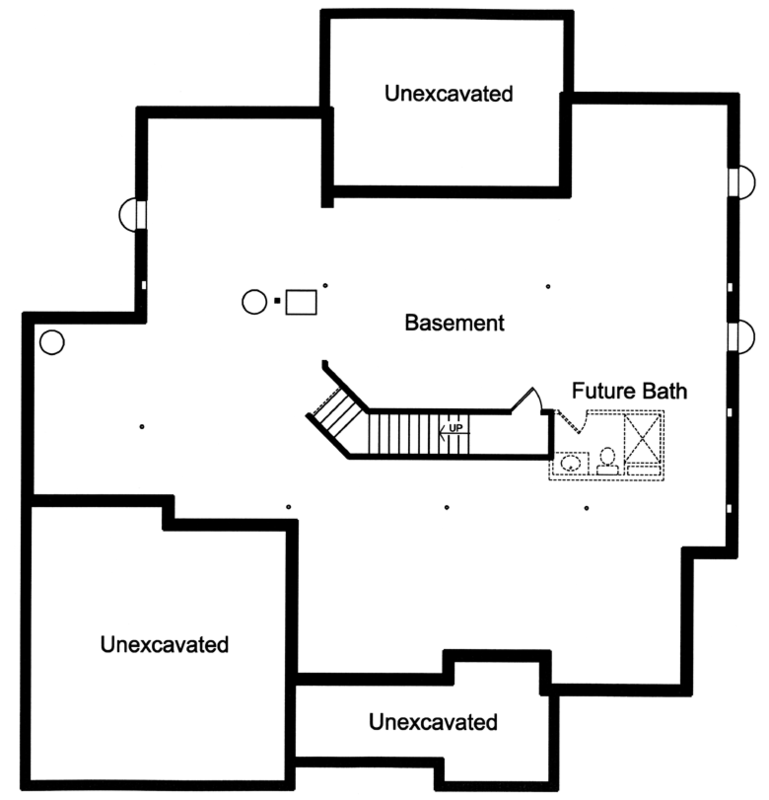 Formal and informal spaces, a private Library, a Master Suite with deluxe bath and a second floor that offers a balcony, bedroom with private bath and two bedrooms with a shared bath, create a functional interior that offers luxury and convenience. The siding and stone façade provide a rich, textured look to the exterior. The air of an English Country Manor is re-created in the Stone Cove. 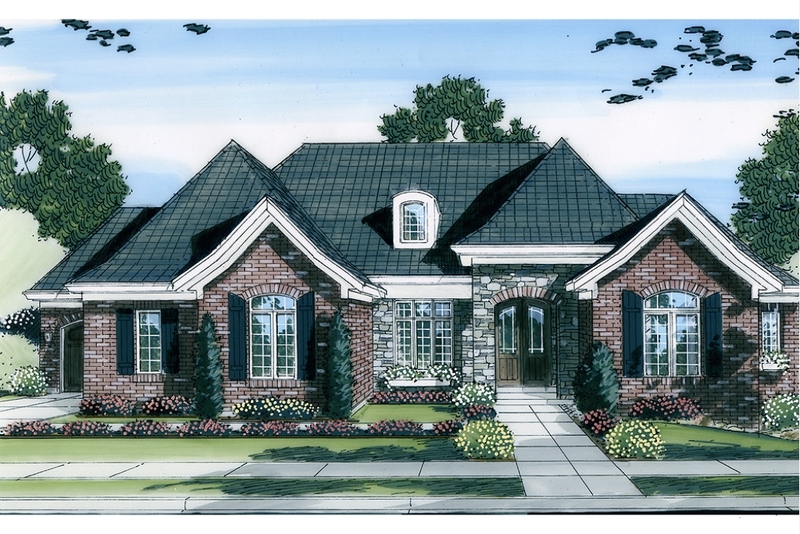 The brick and stone exterior is enhanced with shutters, arches and a columned front porch. Arches are repeated in the interior and various ceiling treatments are featured throughout. 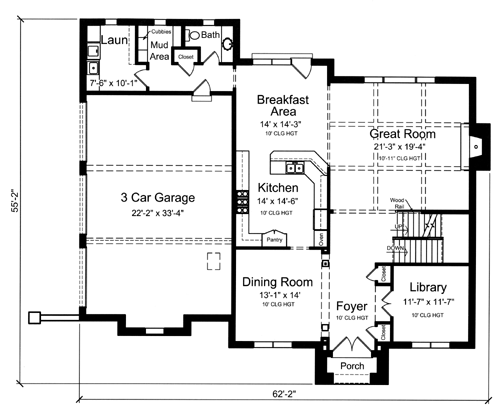 Views from the entry include the great room, formal dining room and library. 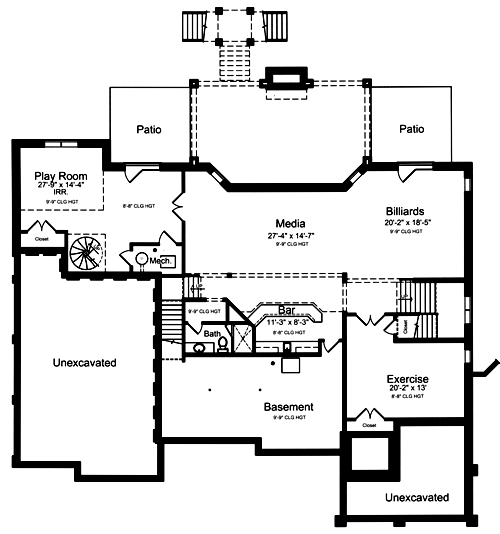 Other areas of fun and enjoyment include a large kitchen/breakfast room, pub and hearth room. A highlight of the home is its inviting outdoor, summer living room with stone fireplace and wood-beamed ceiling. 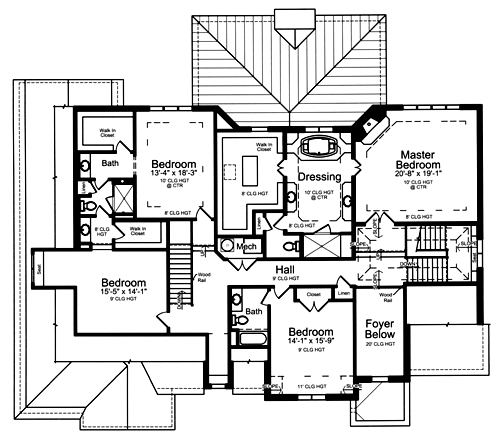 The first floor master bedroom pampers the homeowner with its luxurious surrounding, and three upper level bedrooms each with private access to a bath and large walk-in closets make this home the perfect fit for your family. 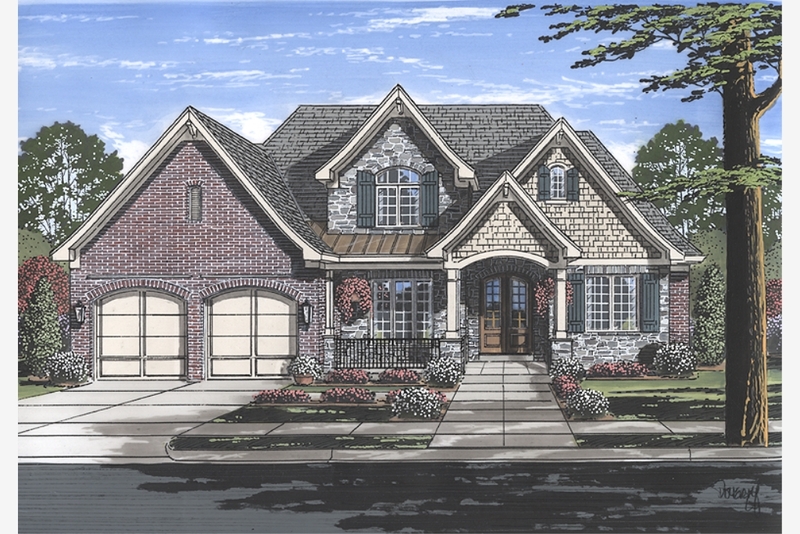 The stone and brick exterior with multiple gables and side entry garage create a home that will enrich the look of any community. The impressive foyer offers a dramatic view past the dining room and open stairs through the great room and out to the rear yard. 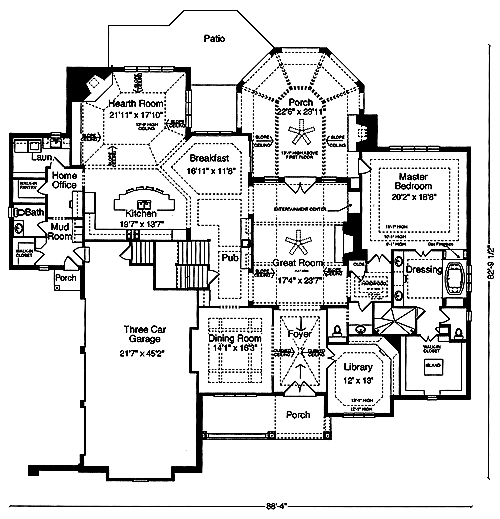 Exquisite columns, 13' ceiling heights and detailed ceiling treatments decorate the dining room and great room. The gourmet kitchen with island and snack bar combine with the spacious breakfast room and hearth room to create a warm and friendly atmosphere for family living. 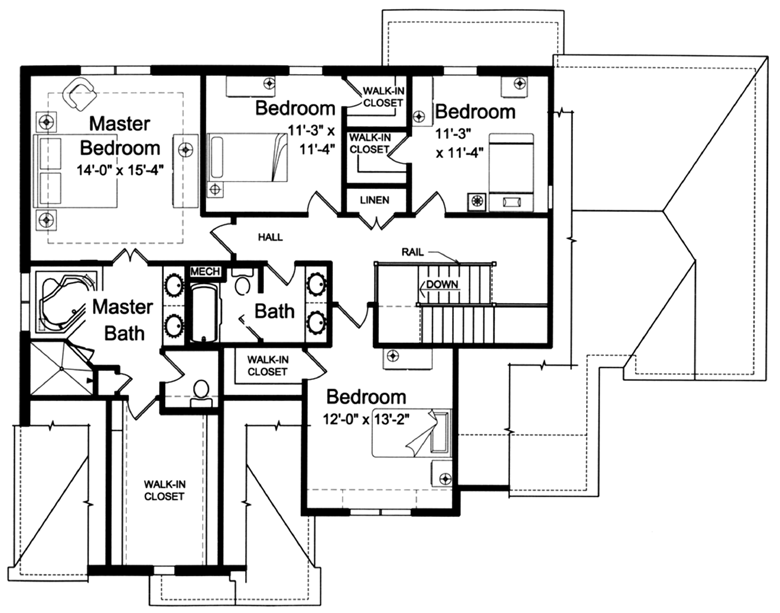 The luxurious master bedroom suite with sitting area and fireplace is complemented by a deluxe dressing room with whirlpool tub, shower and dual vanities, all designed to pamper the homeowner. Two additional bedrooms each with a private bath and large walk-in closet complete the main level of this home. 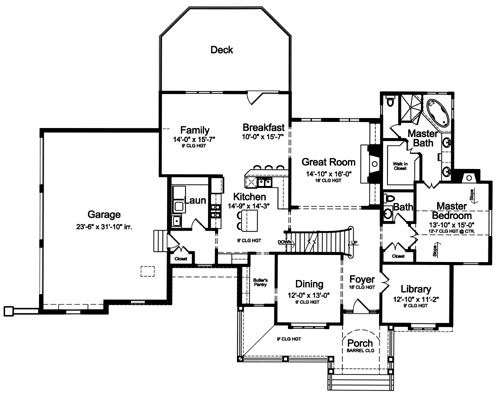 Don't overlook the fun and excitement that can be experienced in the finished lower level. 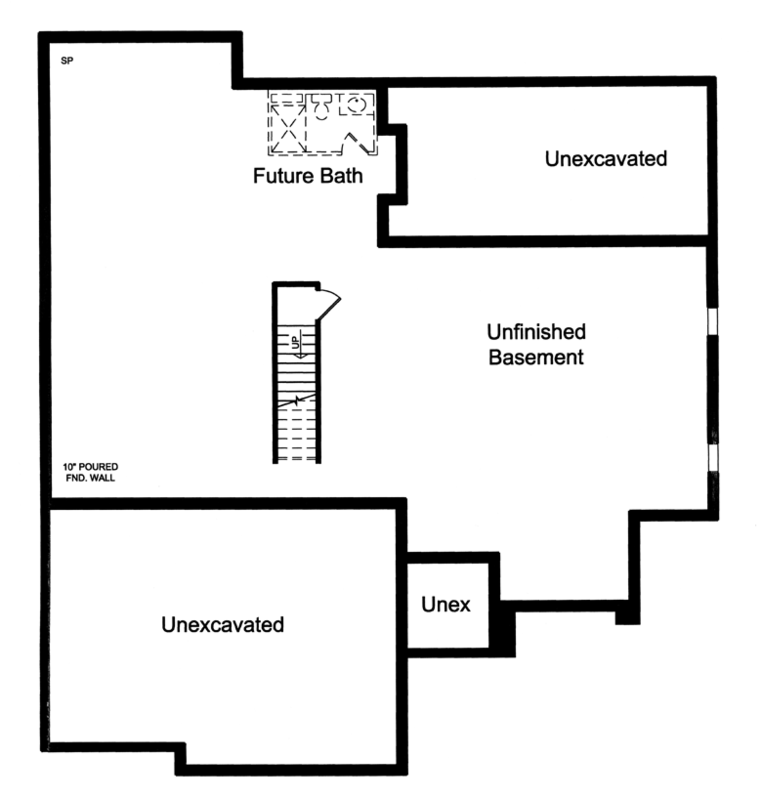 full bath and additional bedrooms. A four car attached garage is an unexpected surprise. This beautiful home has much to offer, with a large Great Room, Kitchen/Hearth Room/Breakfast Area combination, a formal Dining Room, various ceiling treatments and 3 bedrooms. The beautiful Foyer offers a view through the Great Room to the rear covered deck showcasing indoor and outdoor gathering spaces. A wet bar becomes a divider between the Great Room and Kitchen and a large island with seating defines the Kitchen. A raised ceiling tops the Hearth Room and Breakfast Area and a gas fireplace creates a warm environment. 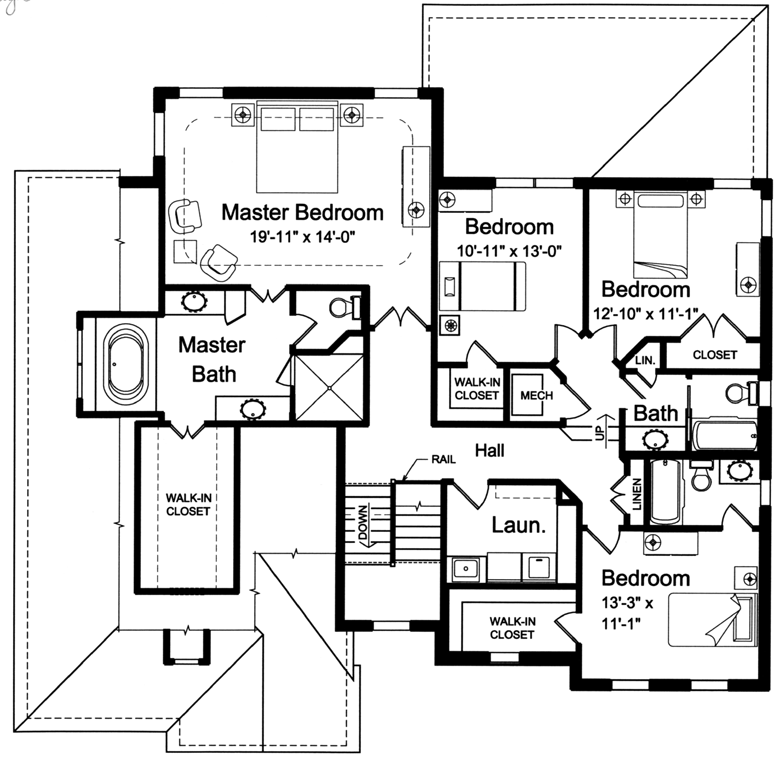 The Master Suite highlights a whirlpool tub, shower, double bowl vanity, and raised ceiling. Access to the rear deck from the Master Bedroom is a delightful surprise. 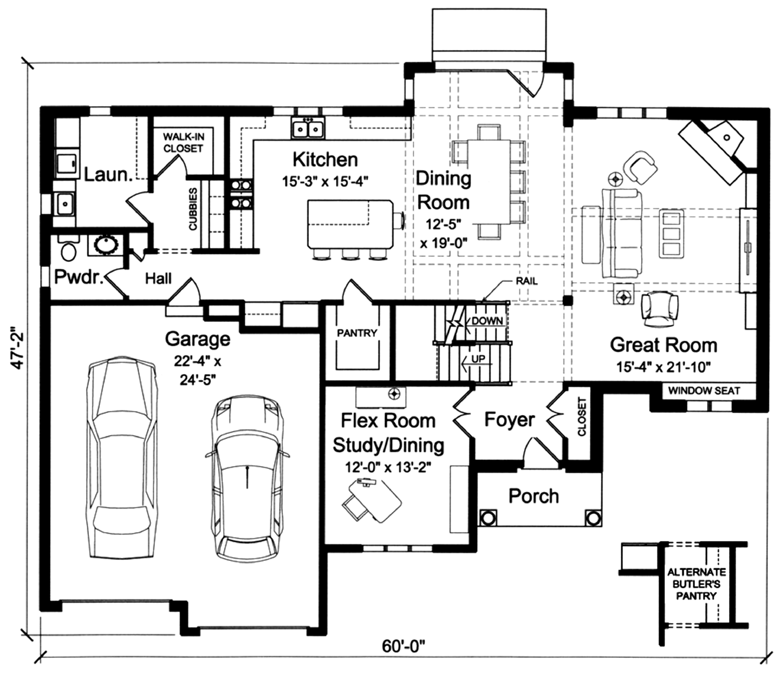 A mud room and Laundry Room near the three car garage aids in an orderly transition from the outdoors. 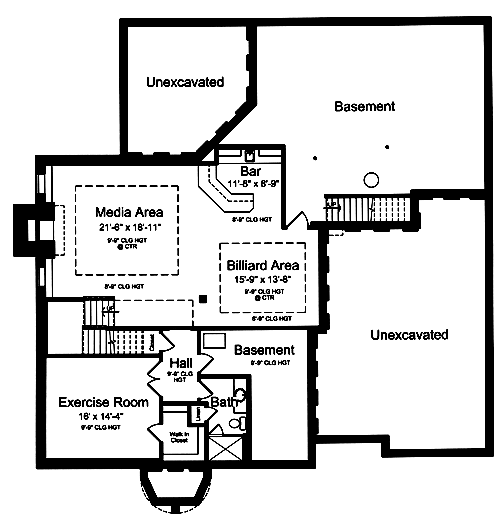 This house is designed with a full walk-out basement foundation that can be finished to offer additional living space. Large open spaces create functional rooms that bring the family together for private family time or for larger social gatherings. A 7' 6" island defines the Kitchen and a Gas Fireplace decorates the Great Room. 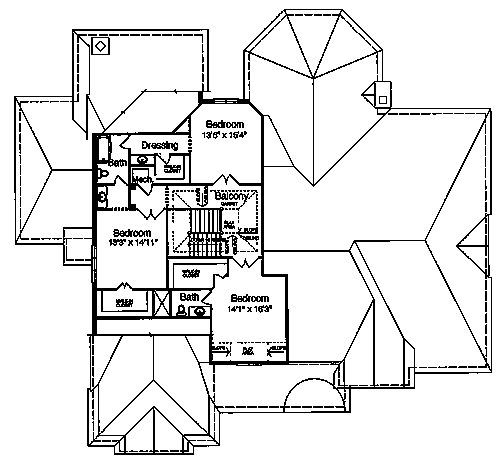 A first floor Master Suite features a raised center ceiling height, double bowl vanity, whirlpool tub and large walk-in shower. Areas of the home that help organize and maintain order include a Mud Room with cubbies, Laundry room with walk-in closet, walk-in Pantry and recessed desk area. 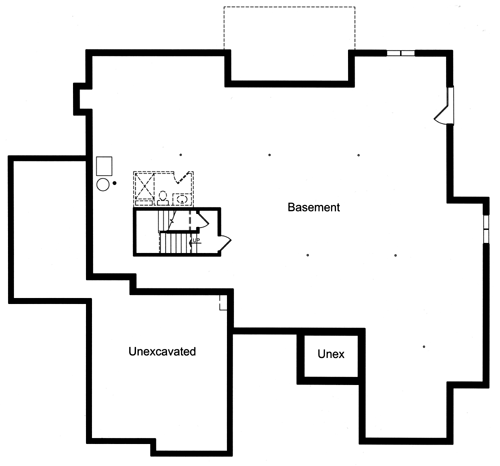 The second floor features 3 additional bedrooms, one as a private Guest Suite and two that share a Jack and Jill bath. A covered porch provides for outdoor enjoyment.